Has the glass ceiling been shattered? There is a widely accepted perception that it has. 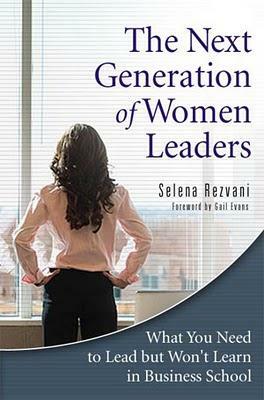 However, as author Selena Rezvani points out in chapter one of The Next Generation of Women Leaders, although women make up 46.5 percent of the U.S. workforce, they constitute only 15.7 percent of corporate officers. What you won’t learn in business school, which Rezvani discovered from interviewing top women executives, is that social, economic, psychological, and even generational barriers still prevent women from reaching the top. But don’t despair. This book is chock full of highly useful tips and information to help women of all ages creatively circumnavigate these roadblocks and negotiate their way to the top. A John Hopkins University MBA graduate and successful consultant, Rezvani conducted thirty interviews with top women executives in the corporate, non-profit and government sectors. She then analyzed her data for trends. The overarching themes of her analysis are covered in chapters two through nine, and address everything from career orientation to maneuvering office politics, networking and negotiating. Although this may sound like any other book on how to succeed in business, it contains plenty of information that might otherwise take you your entire career to learn. In fact, The Next Generation of Women Leaders reads more like a handbook that you will go back to at different stages in your career. There is an emphasis in this book on networking, which many of us are tired of hearing about. However, Rezvani’s presentation is empowering. She describes networking as a lifetime activity that helps women forge lasting relationships, learn more about their areas of business, discover other career paths and develop outside interests and skills. She also emphasizes the importance of women’s networks and having women as role models. The author includes some helpful tips on networking etiquette and where to focus your energy. Given my own particular situation as a mother and professional, I was interested in the chapter on work-life integration. The author tackles the “You can have it all” message that women have bought into and addresses the underlying societal pressures on women to be the successful executive, the cookie-baking mother, the physically fit and attractive partner, the friend, the crafter, the daughter, etc. Rather than attempting to balance, or juggle work-life demands, we are instead to integrate a select few work-life priorities that give us the most satisfaction. In a nutshell, the “you can have it all” message does little more than hold us back. The author originally wrote this book because of the dearth of business books targeting Gen X and Y women, but there’s something in this book for women of all ages, especially those trying to rejoin the labor force or attract talent to their companies. I usually give away the books I review, but this one is now on my bookshelf.